Each section has an almost mundane, simple, universal title that serves as a starting point for developing the main thought, whether it be about the club sandwich, one of Foucault’s favourites, the horror, the truth…or any other aspect of our lives. Steinweg masterfully tackles contemporary issues, and connects philosophy to daily life experiences, society as well as art. “His capacity to implicate the other is beautiful, bright, precise, and logical, grounded in everyday questions, which to him are always big questions. Marcus Steinweg has the knowledge and credibility that can make someone – actually anyone – love philosophy, just because he loves it himself.”3 Even if you are not a fan of philosophical thought, Steinweg’s words and hard-core philosophy will make you reconsider the notion. Crafty style of writing and even the carefully composed contents of Terror of Evidence gives a reader a choice. A choice that involves either to follow the contents layout as Steinweg himself presents it, or to get lost in no particular order in interesting and thought provoking aphorisms that tell a story about philosophy, some of the greatest philosophers of our time, art and life. 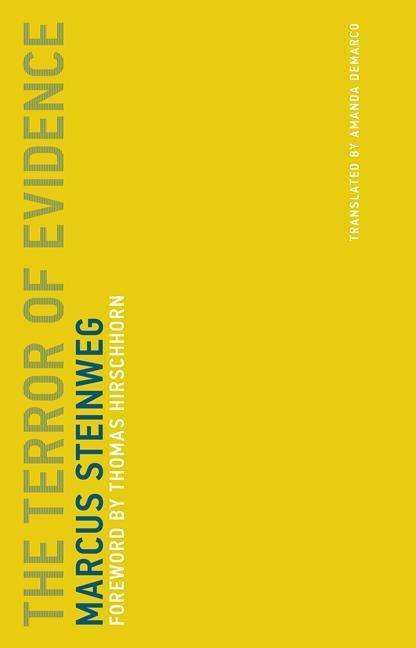 In Terror of Evidence, Steinweg builds a colossal sculpture, a philosophical work of art, which, in its own right, will never be finished. It is always growing, and always creating something new, allowing us to perceive it in our own way, to develop our own process of thinking, and in the end, “…to think more, to think more clearly, to think more powerfully, to think faster, to think beyond.”4, or, in other words, to think for ourselves. Tanja Jurkovic is a PhD candidate in Film and Media at the University of East Anglia, UK. Her research interests include horror and Gothic genre and theory, Balkan cinema, national identity, representation of mental disorders in film, as well as film, media and theatre in general.